Decking has become a one stop solution in the garden for smoothing out bumpy ground, creating a stunning feature and making gardens much more manageable. With belts being collectively tightened around the land and more and more people making alterations to their homes rather than moving, decking has recently experienced another surge of popularity. A decked area is a fantastic and effective way of creating extra living space outdoors, without incurring major costs and all in a relatively short time too. Decking is extremely versatile. It’s easier to construct and handle than bricks and paving slabs and can be successfully designed around the style and age of your home, as well as the shape of your garden. If properly constructed and maintained, your deck will last for many, many years and will be the prime location for many a barbecue, summer alfresco dining, evening drinks and social gatherings for years to come. A well designed decking area really will become a seasonal additional room in your home. So what should you consider before you plan decking? Here at D&G Garden World we offer a complete decking service from planning to construction to practical advice on keeping your decking in tip top condition. We’ll advise you on everything from the best material for your decking, how to deal with problems such as weathering to the most practical planting for your specific decked area. Things to consider include if you’d like your deck to have different levels. If so, balustrades serve the dual purpose of highlighting the change of level as well as a decorative design feature to your decked area. Unless your deck is completely flush with the ground then some form of balustrade or barrier should be included, this could be anything from a simple decorative border, raised planters, trellising or pots. Another consideration should be what you’d like to use your decked area for. While most customers want a dedicated decked area in the garden to place an outdoor table, chairs and sun loungers on, decking, if properly constructed, is strong enough to hold a hot tub! 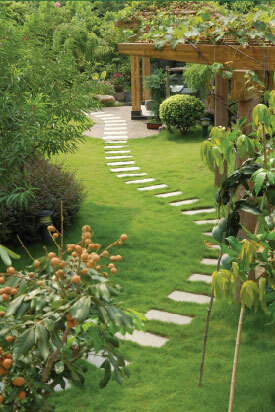 With a good landscape designer the possibilities really are endless.